British beef producers currently enjoy the highest cattle prices on the planet. The beef sector also enjoys a high level of support in the form of subsidies. Beef consumption has survived a succession of challenges and red meat continues to show resilience as a highly popular food. So why are suckler cow numbers continuing to decline? If we cannot derive profit from these benign trading conditions which should give producers confidence in their enterprises, fundamental changes are required to our cost structures. It seems unlikely that the consumer will stand further price increases to compensate. Britain was regarded as the Stockyard of the World only a generation ago. Our breeds, Angus, Hereford and Shorthorn were exported to North and South America and Australasia in large numbers. These countries are now our principal competitors with an exportable surplus to trade on the world market. Unsubsidised, they are able to undercut our prices with beef that has in some cases traveled half way around the globe. Since the early seventies, we have been encouraged to produce leaner cattle with faster weight gains and increasingly extreme muscling. The shape of the ideal steer has changed radically with the trade demanding higher carcase yields. This demand has resulted in increasing use of Continental breeds not only as terminal sires but as a component of the suckler cow. Emphasis has been on output rather than efficiency and the cost of production. Rather too many of us measure success by gross market returns and pay scant attention to cost reduction and increased net returns. The UK now has a high-cost production system which relies on grain feeding for both the finishing of the beef animal and for the maintenance of the cow herself. Can we learn from our competitors? Across the world, our former customers turned competitors have some advantages which we cannot overcome. Pastoral and range cow herds require no winter housing and can survive winters with little or no feed supplementation. Fixed costs are very much lower and the cattle occupy land largely unsuitable for cropping. Feedlots only employ high energy diets after “backgrounding” (the growing period post weaning) for regulated finishing periods. British breeds are the cows of choice and terminal sires are used only in some cases to produce a slaughter generation. The trend towards larger cattle within these British breeds has recently reversed with more emphasis now on medium frame size combined with conversion efficiency. 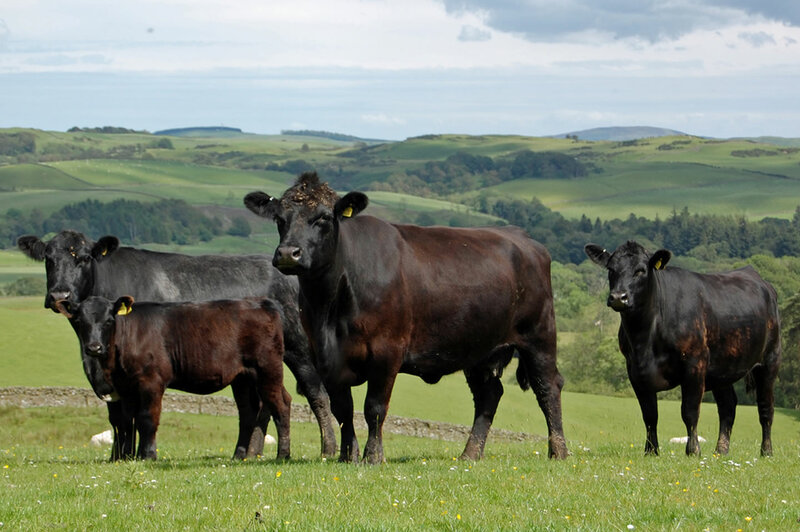 The provenance and traceability of our home produced beef through farm assurance schemes and perceived premium quality (Hereford, Shorthorn and Angus), will give us a certain amount of protection from cheaper imports in the meantime. We must remain aware that assurance schemes are already in practice abroad and the breeds attracting a premium here are the very same breeds being used in the pastoral regions of the world. In the future, sustainable beef production will rely on low-cost grass-based systems using much less grain (less than half a tonne per unit) and the successful development of low maintenance suckler herds with controlled costs which leave a profit at current prices. Systems will be forced to compromise between market demands and efficient conversion of grass to protein. The profitability of suckler enterprises is not so much influenced by the value of each calf sold but by the number of calves sold, less the cost of maintaining the cow herd. Ideally, we will be able to sell these calves at a premium for their eating quality. So what does the ideal cow look like? Cows in a profitable suckler enterprise should produce their first calf at two years of age. The increased number of calves produced more than justifies this policy. Maintaining heifers until they are older before they contribute to the herd output cannot be as economical as calving at two years old. Ideally, cows should produce and rear a calf each year thereafter for 8-10 years and the herd will thus have a low replacement rate (circa 15%). We will require fewer heifers and greater selection pressure will ensure we retain only the best animals. As a result, more heifers will be available to sell each year, perhaps even as replacement heifers to other breeders. Longevity and fertility are thus vital to keeping replacement rates and maintenance costs low. Efficient cows will gain condition at grass in summer, conceive their next calf, and then use some body reserves over winter before calving and returning to grass the following year. Over wintering on 3.5 tonnes of silage or less without cereal supplementation should be achievable. Mineral supplementation should only be where an identified deficiency exists. Equally, you should feed small amounts of grain when a late spring delays grass growth. Each cow should produce a calf weighing 40% of her weight at 200 days (e.g. 232 kg at 200 days from a 580 kg cow). Such a heifer calf will have no difficulty in reaching desired weights for bulling at 15 months to calve down at 24 months. These performance weights are not extreme, yet are sufficient to grow on and achieve a carcase weight of 320 kg at 20 months following a second summer grazing. This production cycle, therefore, majors on grass and forage products which are drastically cheaper to produce than cereals whether purchased or grown. Characteristics of the cow which can achieve this lifetime performance. Sound feet and leg structure. Correct udder formation and teat structure with adequate but not excessive milk. Rumen capacity to convert roughage. Medium frame size and weight of around 550-600kg. How do we breed this suckler cow? It is worth adopting a self-replacing policy even for health reasons alone where at all possible. Replacements bred from the dairy herd and daughters of terminal sire breeds both result in females with high feed requirements. It is unlikely they will possess both the essential characteristics and those we desire. We should breed replacement females from cows already performing well. Where possible, selection will also be from older cows that have survived a strict culling policy. In selecting a sire for a suckler replacement breeding program, there are several key considerations. The breed should be strong on maternal characteristics as discussed. Is a premium available for branded beef of his breed, (Angus at M&S, Shorthorn at Morrisons or Hereford from Waitrose)? You should make your sire selection from a herd with health scheme accreditation. Avoiding diseases such as Johne’s and IBR is important. Avoiding buying in BVD is essential! Select a bull with sound conformation and structure. He will need to be able to serve upwards of fifty cows for several years. More importantly, if his daughters are to last for 10-12 years their feet and legs must carry them for this period. EBVs are a subject of considerable debate. They are another important tool and will become more so as their accuracy improves. That said, their success will depend on how the industry applies them. It is tempting to select for extremes, but I would suggest that avoiding extremes is more important. Too much milk will result in lean cows which may not re-conceive easily. Very easily born calves may not have good growth rates and might have difficulty in calving themselves at two years of age. Too much muscling may give the same problems whilst too little will reduce the value of the end product. High 600 day weights will produce large cows with consequent feed costs. It is essential to check temperament, hair type, testicle size and formation, and any other trait important to the environment in which you are breeding prior to purchase as these traits do not yet have recorded EBVs. Where possible have a good look at his mother or female siblings. Looking at a bull tells you very little about the teat and udder structure of his daughters. Seeing his dam will tell you a great deal that will not see looking at the bull himself. Good feet, legs and pelvic structure in the bull’s dam will all increase the likelihood of a successful breeding programme. The teachings of Professor Jan Bonsma have had a profound influence in the selection of our own pedigree breeding herds. Bonsma recognised that the fertility of a bull or cow is greatly influenced by their hormonal makeup. This was manifest in phenotype – what we now describe as masculinity in a bull and femininity in cows. Bonsma had the ability to describe an animal’s breeding history and to predict its future fertility from its appearance alone. This knowledge and understanding of hair patterns and physical attributes verifies the importance of visual appraisal in selection. The stockman’s eye remains his most important tool, yet any data which adds to his knowledge can complement traditional skills. Breeding a sustainable herd of suckler cows takes at least ten years. The influence of successful cow herd selection will last a further ten. It only takes one bid or phone call to change the bull. The challenge for the UK beef industry is to become more competitive through a lower cost structure. We are farming the resources available to us, principally grassland, rather than striving for the perfect product in a meat industry which has little concern for its cost of production or the sustainability of its breeding systems. We have been led in the direction of increased costs and leaner products which the consumer has at last realised is not the succulent beef they are once again beginning to appreciate.